If you want to add some cottage-style charm to your garden, plant Lady's Mantle (Alchemilla Mmollis). It's an old-fashioned herbaceous perennial that, besides being beautiful in gardens, is also used in making lotions and soaps. Lady’s Mantle is a long-lived perennial flower that is fairly low-maintenance and blends well with other spring bloomers. The foliage looks good all season and can make a nice ground cover under small trees. A mass planting of Lady’s Mantle is very eye-catching when in bloom, but kind of loses its impact after flowering. Lady’s Mantle makes a nice contrast for bright daylilies and roses that bloom at about the same time. It's especially eye-catching used in contrast to burgundy and purple foliage. Lady’s Mantle plants form a nice sized clump, although they will also self-seed in many gardens. The seedlings are easy to lift and move to another spot in the garden or give away to grateful friends. If not kept in check, A. mollis can be an aggressive self-seeder. Sow seeds in the garden in the fall or early spring or start them indoors about six to eight weeks before the last predicted frost. When the plants reach 4 inches in height, plant them outdoors. Keep the transplants 12 inches apart, though the plants will quickly fill in the empty spaces. Lady's Mantle doesn't tend to suffer from any pests or diseases. To avoid leaf scorch, the most common issue, give the plant enough water and a partly shady location. Lady's Mantle grows easily in full sun to part shade, though sun scorch can be a concern in full sun. The plant tolerates close to full shade and prefers afternoon shade in hot climates. Mulch around the plant, but not up to the stem. Lady’s Mantle tends to hug the ground, so keep the mulch from covering the plant. A. mollis is drought-tolerant once established and doesn’t like to sit in wet soil, but in high heat or full sun, regular watering is required to prevent the leaves from turning dry and brown. Lady's Mantle plants can adapt to a variety of climates. However, if it's a hot climate, give the plant plenty of shade. Areas with high humidity may experience some fungus problems, particularly if the crown is kept damp. Good air circulation and allowing the soil to dry slightly should help. A prolific self-sower, it's not necessary to fertilizer Lady's Mantle plants. Lady's Mantle is easily propagating with seeds, division or separation. Divide the plants in spring or late summer by root division and give away the extras. Alchemila alpina: Known as Alpine Lady’s Mantle, A. alpina is much smaller than A. molliis, with silver edges on the leaves. Given the opportunity, Lady's Mantle can easily grow out of control. To avoid this, deadhead the flowers as soon as they begin to wither to prevent self-seeding. If the plant begins to grow in an undesired area, pull it up quickly. The entire plant can be cut back, if necessary, and it will produce fresh growth. Lady’s Mantle can be grown from seed, seedlings or divisions. If you’d like to try growing Lady’s Mantle from seed, direct sow outdoors after all danger of frost. Barely cover the seeds and keep them well watered. You can start them indoors a couple of months before your transplant date. It takes about 3 to 4 weeks for Lady’s Mantle Seeds to germinate, so be patient. It's easy to start Lady’s Mantle from seed and it certainly self-seeds well on its own. The plants are readily available and somewhat inexpensive, so most gardeners start out with at least one plant and then see how well it seeds on its own. Lady's Mantle also divides easily. Plant at the same depth as it was in the pot. 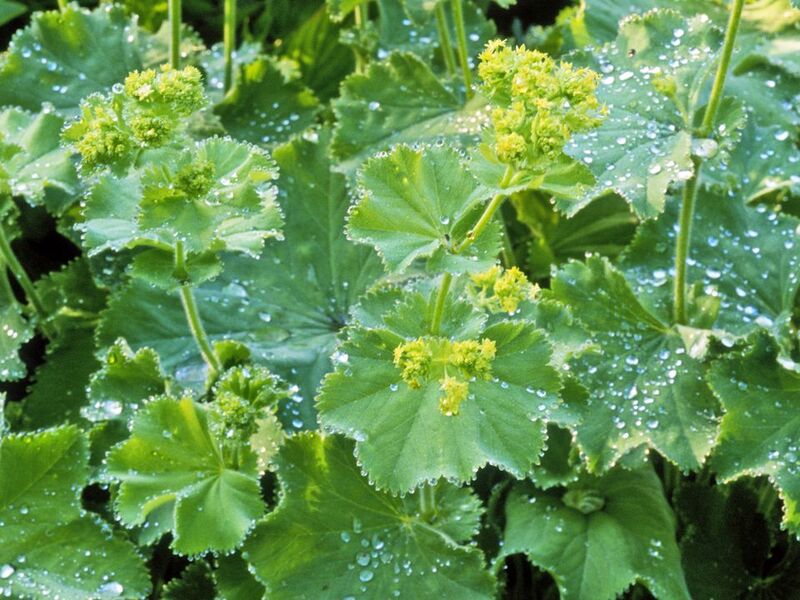 Supplemental feeding is not usually necessary with Lady’s Mantle unless you have poor soil. If so, a handful of slow release organic fertilizer can be mixed in at planting time.